Yesterday was the "Modern Women of Sewing" event at the new York Public Library, held as a part of the Crafternoon series, and for those of you that missed it, heres a bit of a re-cap. The idea behind the event was to bring attention to all of the amazing rare books that the NYPL has in its cavernous, multi-level archives (known also as "the stacks"), specifically the books that an artist or craftsperson would find especially inspiring. Liesl Gibson of Oliver + S, Denyse Schmidt, and myself were all asked to present our favorites from among the vast collection. Considering the selection, this was almost an overwhelming task. In the end, we all gravitated towards very different types of books, but browsed with great interest each-others selections. I showed illustrated (and refutable) proof that a mermaid was once captured off the coast of a place called Ambon, Liesl showed us the vintage fashion and kids books that were the earliest inspiration for Oliver + S and re-introduced us to a few fantastic children's book illustrators, and Denyse showed examples of the works of the modern artists that inspired her to become the artist and quilter that she is today. Then the three of us and about 150 guests sat in one of the loveliest, grandest rooms in the Library, surrounded by the most amazing tapestries and a hundred or so very rare books, and did a little crafting. Afterwards, over a late lunch at the Oyster Bar at (the equally grand) Grand Central Station, we all agreed that it was the most fun we had had in a long while. 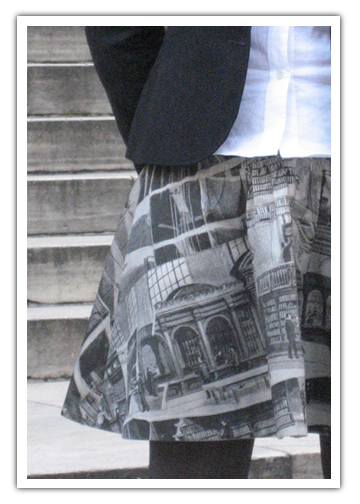 In honor of this vast and inspiring collection of books and images and of this grand old building I designed this skirt. The artwork (above, in its original form, and left, printed on fabric and made into a skirt) is from the library's immense digital collection, which is available (and catalogued perfectly, try searching for anything via keyword) to all of us right here. I purchased the rights to use the image and received a password that allowed me to download a high resolution copy, which I then sent to my brilliant friends over at Spoonflower. The sateen is just one of their lovely fabrics available to print on, and was the perfect choice for this skirt pattern, which requires a fabric with a bit of "body" to achieve its festive fullness. 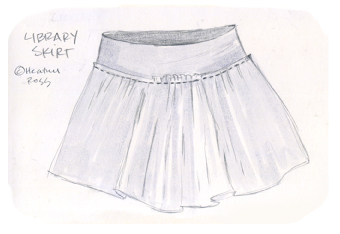 If you have a copy of Weekend Sewing, then you already have the pattern for this skirt. You will need to download these instructions (its a pdf file), which show you how to revise the skirt pattern piece for the Saturday Night Silk Jersey Set to make this skirt, which is 19" long and has a side zipper. It was tough to choose which artwork to use, but in the end I knew this was the perfect piece. 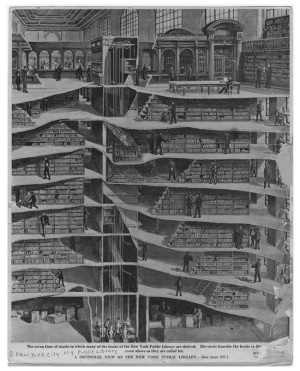 The drawing is of a cross section of the library's underground stacks, showing in great detail how an enormous collection of books could be stored, organized, and made easily accessed by all. It even shows the pulley system that was used to carry the books from deep underground, and up into the hands of a patron waiting in the library's beautiful "reading room". When I took a moment to look at it carefully I realized that our modern data storage systems (such as our computers and the internet) isn't as much of a replacement of the library's system but more an evolution of the same. We may have found a way to compact our data into tiny binary coded bits, but we still organize it in the same way: by guessing what we will be looking for at some now-unimaginable point in the future. There are at least a zillion beautiful fabric prints waiting for you over at the NYPL's online digital collection, from beautiful paintings of birds, butterflies and flowers to the handwritten (and hand-edited) poetry of Walt Whitman. The hard part is choosing. Once you have fallen in love with something, you can purchase a high resolution copy to download, and, if you like, send it over to Spoonflower. For this skirt you will need about two yards of fabric. Please be respectful in using the work of other artists and of using the library's digital collection. The images are meant for your personal use and enjoyment, but there are rules and regulations about using them commercially. Take the time to ask questions and be forthright about what you intentions for use are, because even though we have all become accustomed to this wonderful world of free online access, we all need to be respectful of this privilege and of our responsibility to help maintain and protect this wonderful and extremely rare collection of books and images that is our own history. Todays post isn't so much a gift list as it is a holiday survival list. I can personally vouch for the effectiveness of each and every product here, without these items I would not be heading into the high hectic holiday season with such a brave face. In fact, I am wearing two of these things as I type this. Three, if you count the under-eye concealer. Four if you count the new bit of tummy that has arrived since finishing off the dark chocolate covered peppermint yoyos. Wow. How about that. It's just so important to eat seasonally. Trader Joes has these amazing dark chocolate covered peppermint JoeJoes (like Oreos, but I suspect with slightly more opiates) for a very limited time. Buy more than one box. Just do it. You can freeze them, if they even make it home with you. The ever diligent Candy Blog has even reviewed these as they compare to the Oreo competitor (please.) for you here. Hitachino Nest Beer, made with rice instead of wheat, is adorable and tasty. Its nice and light and looks lovely on the table, and leaves you slightly less puffy in the morning for some reason. Especially good with spicy foods, dresses up take-out beautifully. Lovely Glimmering Super Long Thigh Highs Because its only December 9th and I'm already sick of pulling up my $%#! tights. You can pull these on under your nightie in the morning and delay the putting on of pants by at least one additional blissful hour. YSL Touche Eclat Radiant Touch: overpriced and worth every penny. Will conceal late nights, early mornings, snoring cats, husbands who have suddenly and inexplicably learned to sleep with their pointy little elbows sticking out, long nights wrapping gifts followed by early mornings full of candid photos, too much beer, too much eggnog, too much take-out, and not enough money. Really, all of it. Ojon Rub Out Dry Cleanser, because its not that I'm too lazy to wash my hair more than once a week, its that the instant that the heaters go on in NYC, I become a chia pet. This stuff instantly fixes the greasy bits up top, the frizzy bits at the end, and the dullness in between. And don't tell that woman with the perfect skin at New London Pharmacy who sold it to me, but I also tried it on my sheepskin rugs, which are such a lot of work to shampoo. Worked pretty well. JCrew Cashmere Turtleneck Sweater JCrew is really working for me lately. It might be because they let me shop in my neighborhood store with Lobo, but I think they are doing a lot right these days. This year they made their cashmere turtleneck sweater a few inches longer than its been in past seasons, just in time for Dark chocolate covered peppermint JoeJoe season. Now it is simple cozy perfection. Headphones The kind that stick so far into your ear that you are hoping not to bump into anything important. Really tuning out is the only way I can get any work done this time of year. I'm pretty sure I am becoming that person who sings along without knowing it, just based on the way the cat has been running out of the room suddenly. Sweatpants I know, JCrew again. But honestly, I can't say enough about this pair of sweatpants. I'm going to buy another pair tomorrow. Really. All these years wearing those overly revealing if not somewhat humiliating tight stretchy yoga pants to the gym, trying to avoid catching a glimpse of my rear self in the mirror. What was i thinking? All along I could have been in these loose-fitting wonders, with the legs pulled up on my calves just so, looking sporty circa 1985, before MC Hammer came along and ruined everything soft and baggy. My new favorite shoes. I tried them on at one of my favorite little stores in Soho and almost bought them there even thought they were a size too small. It took me a week to find them elsewhere, a day of agonizing over the cost, and then a husband and a birthday all intervened and there they were. I can't even bring myself to get rid of the box they came in. I know, extremely expensive. Also extremely comfortable, made for dancing, soft stretchy leather, a bit of a platform for extra height. I admit, I didn't really get the ankle boot thing at first, but when it got too cold to leave the house in ballet flats and facing another winter in tall black boots just made me feel sad: I understood. There you have it: a bit of comfort and joy, and also some very good chocolate. I have long been a fan of the beautiful Illustration blog Drawn, which is on my daily-visit list. It was through them that I was introduced to the work of David Huyck, which is funny and beautiful and feels as though it comes straight from the imagination of an eight year old boy. I was especially entranced by his tiny little derby cars, one of which depicted a frozen ice man. I also really love his paper airplane series, and I am certain that I can hear a small boy making airplane sound effects when I look at them. David is also responsible for the very exciting Cloudy Collection, an ongoing project that issues a group of limited edition letterpress images quarterly. David contacts artists whose work he likes and gives them a theme, plus two colors. The colors are important because all of the artists works are grouped together and printed (on a big old traditional letterpress) simultaneously, then cut apart.The end result is six images, all related, all by different artists. David then offers them for sale, as a collection, for a very good price! As you can imagine, Cloudy Collection has become quite popular, with past editions often selling out before new ones emerge. A few weeks ago David contacted me about being a contributor for his latest Cloudy Collection. The theme was to be "repeat repeat" (he had us pattern designers in mind, and also included the incomparable Julia Rothman in this series) and the colors were blue and green. As any third grader worth her box of 64 crayons knows, those are the colors of water and sky. I was tempted to draw seagulls (because white would be a color, too, right?) but then I remembered the postcard of some lady waterskiers I had sent during a trip to Florida last year, and decided that their time had come. Pardon the tangent here, but who here thinks that a kids book about jobs that look really really fun (to kids) like being a lady acrobat waterskier or a lion tamer complete with ample warning about dangers (water up nose, getting eaten) would be pretty great? Ok, tangent over. The newest Cloudy Collection (including my ladies) in its entirety is revealed today, and will be on sale until it's gone. I think I'm going to get a set for my dear friend Stephen The Bachelor (who never reads my blog, so I'm free to talk about him and give him titles) to artsy up his little mannish apartment.... oh, and a portion of proceeds go to the Nature Conservancy! The Owl, The Pussycat, and The Great Big Bag of Coffee. I have long loved Edward Lear's poem The Owl and The Pussycat. Apart from the mismatched lovers themselves, the most captivating element of the story in my mind has always been the items that the two packed as they set out for a strange new world: Honey, and a "great big bag of money". 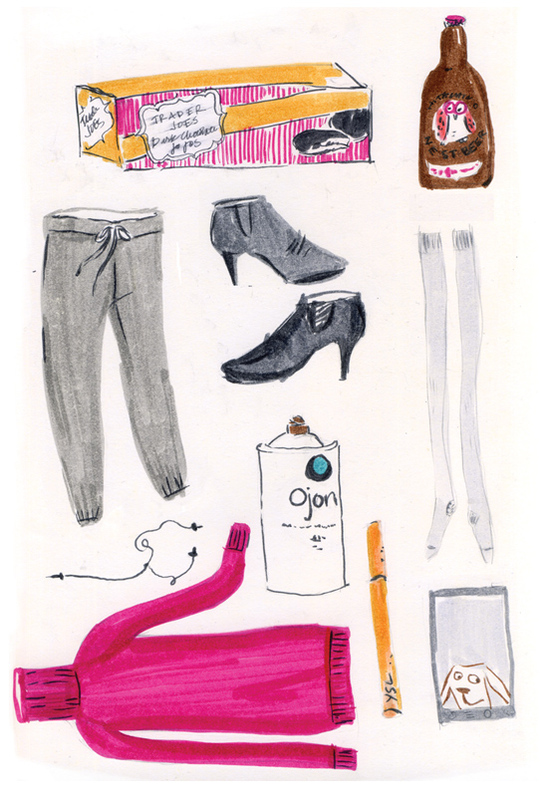 Something about that packing list feels so complete, so assuring, leading any reader to believe that their seemingly scandalous affair and subsequent elopement is something that we can all get behind with confidence that it will all work out for the best, cheering them on from the shores as they row away. I was a little skeptical about the guitar, having once survived a long cold 4th grade winter with a boyfriend of my mothers who also had a guitar on which he could play exactly ONE SONG. Over and over and over again. I would tell you which one it was but then it will be stuck playing in both of our minds all day. I hoped for the Pussycat's sake that the Owl's repertoire was more varied and that the guitar wasn't thrown in the boat at the last minute, with the Owls explanation being something like: "This will be the perfect opportunity to finally learn how to play this guitar", because Sister, I have BEEN there. The honey and the money though? that seemed really promising to me. How wonderful would it be to only require what we could fit in the bottom of a pea green boat? Something about this felt a little... un-relatable to me. I was trying to find a personal experience that might lend a bit of inspiration, and I was reminded of my father in law telling me about his youthful summers on Lake Michigan, which (he agreed with me on this) sound a whole lot like that Kid Rock video. And yes, this link will actually lead you to a Kid Rock video. My father in law and I have this in common: we are both, deep down, fans of canned beer and Kid Rock. So I took a moment and made him this sketch, which imagines the Owl and The Pussycat with an outboard motor and a sixer of tall boys. I did another dozen sketches, none of which are worth showing anybody. They all looked a little forced, like I was trying to re-tell somebody else's story and I wasn't remembering the punch lines or as if I hadn't met the characters first-hand, and was getting very frustrated. This is when I did something for the first time in a very long time: I drank a cup of espresso in the mid-afternoon. And this is what I drew next. Yes, the Pussycat is squeeze-guzzling honey straight from the bear. And the Owl is rocking out. I loved it, but it wasn't exactly a sustainable amount of energy for any of us. Our fearless duo would be out of honey and energy very soon at this rate and we would all be crashing and dismal before dusk. I needed to tone it down. And still, I had lost something along the way that was making it hard to tell this story in the way that I remembered being able to see it as a child. Spending a week with the Owl and The Pussycat has also led to another seemingly permanent development in my life. I'm now officially an afternoon coffee drinker. The addiction was instant, within a few days of my first mid-day cup I was crawling into the kitchen with a splitting headache a half hour after what my brain had already decided was Coffee Time. Oh, the anchor of dependency. Maybe that's why I struggle to relate as well to The Owl and The Pussycat now as I did as a child, because with every convenience, every luxury, every habit that becomes a part of my life I know that I am further away from a ife that allows for spontaneous adventure, or at the very least saddled with a much longer packing list. Maybe if I just stop accumulating things now, I can still manage it. I can see myself pushing off from that dock someday in my own pea green boat and rowing off to lands unknown, accompanied not just by a big bag of money and a squeeze top honey bear, but also a formidable amount of coffee beans, pre-ground. Its calming to imagine my tall, handsome percolator sitting across from me, gleaming with the promise of a productive afternoon. I hope he doesn't try to bring a guitar. While a new baby remains blissfully unaware of that little sweater that you made for him (or the dozens of evenings knitting and re-knitting plus the case of wine and dedicated management of netflix to keep oneself occupied during said endless knitting), toddlers are considerably more selective. 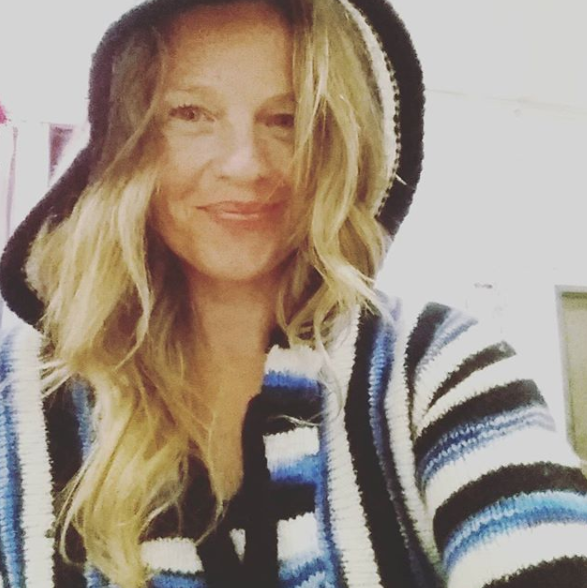 A certain five year old that I know has already requested "No more clothes Heather, because I really don't like clothes and you keep giving me more and I have enough of them and my closet is full". I'm not naming any names, but I think that parents should know that even a childless friend can tell when Mommy has been doing a little bit of coaching in the gift communication department. And admittedly, that it is actually appreciated. Toys have longed seemed the answer to this dilema. But while I have an impressive craft book library, I have not, until Hand Stitched Felt, had a single one that includes such a wonderful assortment of toys and accessories. There has been a need for a book like this for quite some time, and Kata Gold was the perfect person to write it. 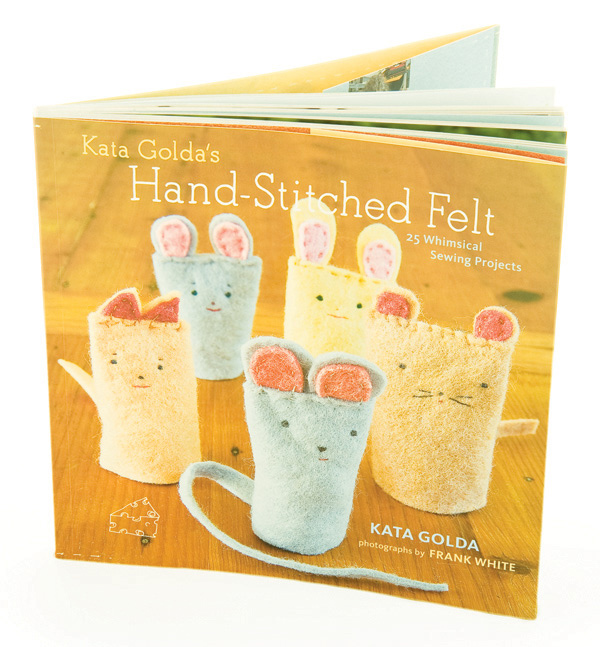 From Hand Sitched Felt by Kata GoldaI have been aware of Kata Golda for some time, having first bumped into one of her little framed portraits of a dapper little mouse dressed in striped cover-alls in a shop in California years ago. What struck me then and what strikes me now about her work is the expressiveness of the simple faces on her felt animals conveyed with literally a few simple lines. Her toys and embellishments are so full of personality and life that they are sure to become well loved members of the family. Melanie just finished this little guy, who I think is especially dear. And maybe its my imagination, but I see Kata in his little face as much as I see Melanie, and I think I even see a trace of Melanies real-life dog. So simple, right? But so totally pee-your pants cute that the entire New York City Craft world has been crazy over them since they arrived in town a few weeks ago, even inspiring an extremely cute little stop action film. You can even win a free copy of Hand Stitched felt by leaving a comment about the video. See more images and projects from Hand Stitched Felt here, on the STC blog, or learn more about it here at STC Craft.